Snow covers streets and lawns in Upper Dublin Township during a Feb. 9, 2017 storm. A potent winter storm on its way to the Philadelphia region will bring heavy snow, but how much you'll have to shovel off your driveway looks to depend on where you live. With the quick-moving Mid-Atlantic storm approaching over the Presidents Day weekend, the National Weather Service has issued a winter storm warning for Saturday night for all of eastern Pennsylvania (except Delaware and Philadelphia counties) and northern New Jersey. Precipitation is likely, but weather models are less in agreement on the amount, and even the type of precipitation near and east of I-95, forecasters said. 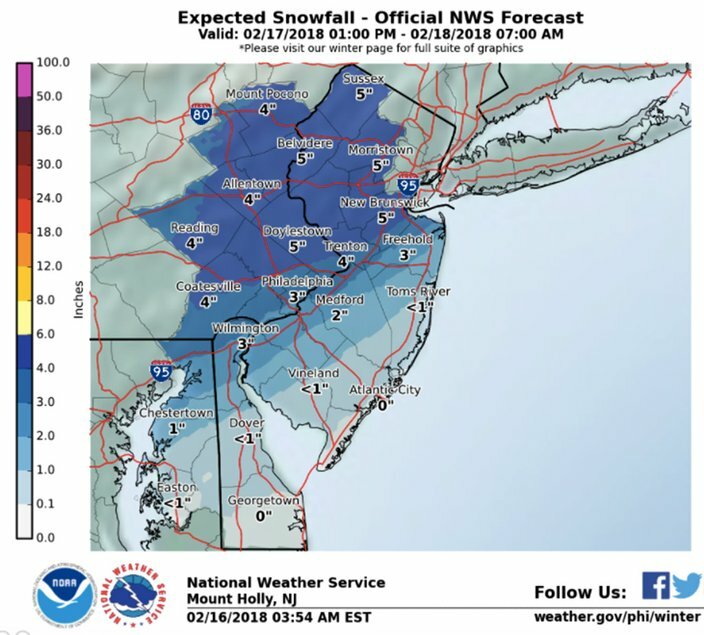 In the northern and western suburbs of Chester, Montgomery and Bucks County, 4-6 inches of snow is possible with the snowing coming down fast enough at times – an inch an hour, perhaps – along the I-95 corridor that road conditions could deteriorate quickly, forecasters said. 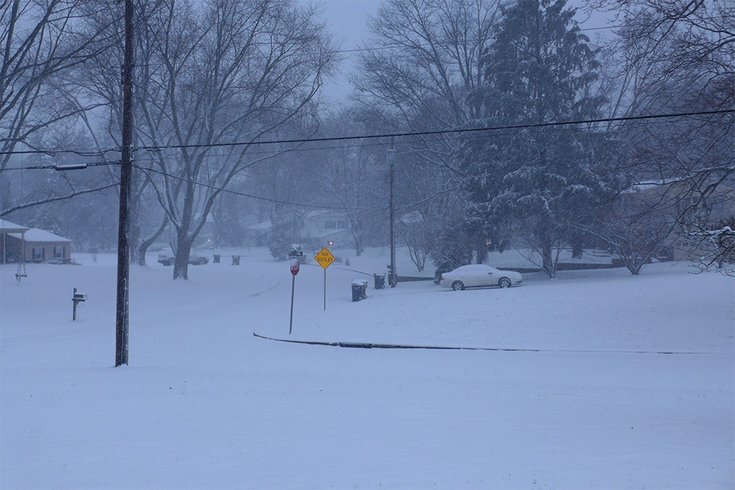 The snow is expected to begin falling in earnest after 7 p.m. Farther to the northwest there should be less precipitation but snow-to-liquid ratios look to be highest in and near the Poconos, with several inches of snow greeting skiers for the holiday weekend. In central and south Jersey, forecasters believe there will be enough warming to result in a wintry mix – snow and rain, with sleet perhaps. Rain is more likely along the Jersey Shore coast. The storm moves away early Sunday and precipitation should end by dawn. The rest of the day will see milder temperatures to melt the newfallen snow. Temperatures will remain mild during the early part of the workweek, with rain showers likely Monday afternoon and record warmth possible Tuesday. Friday: Showers, mainly before 5 p.m. High near 58. Northwest wind 6 to 14 mph. Chance of precipitation is 100 percent. New precipitation amounts of less than a tenth of an inch possible. Friday night: Mostly cloudy, then gradually becoming mostly clear, with a low around 26. Northwest wind 7 to 16 mph. Saturday: A slight chance of rain and snow after 4 p.m. Increasing clouds, with a high near 40. Light and variable wind becoming southeast 5 to 8 mph in the afternoon. Chance of precipitation is 20 percent. Saturday night: A slight chance of rain and snow before 7 p.m., then snow. Low around 31. Calm wind becoming west around 6 mph after midnight. Chance of precipitation is 100 percent. New snow accumulation of 2 to 4 inches possible. Sunday: Sunny, with a high near 49. West wind 6 to 9 mph. Washington's Birthday: A chance of showers after 1 p.m. Mostly cloudy, with a high near 54. Chance of precipitation is 50 percent. Monday night: A chance of showers. Cloudy, with a low around 50. Chance of precipitation is 40 percent. Wednesday: A chance of showers. Mostly cloudy, with a high near 68. Chance of precipitation is 30 percent. Wednesday night: A chance of showers. Mostly cloudy, with a low around 43. Chance of precipitation is 30 percent. Thursday: Mostly cloudy, with a high near 50. Friday: Showers, mainly before 3 p.m. Temperature falling to around 37 by 5 p.m. Northwest wind 8 to 18 mph. Chance of precipitation is 90 percent. New precipitation amounts of less than a tenth of an inch possible. Friday night: Mostly clear, with a low around 16. Northwest wind 8 to 18 mph, with gusts as high as 29 mph. Saturday: Increasing clouds, with a high near 30. Light and variable wind becoming south 5 to 9 mph in the afternoon. Saturday night: Snow, mainly before 4 a.m. Low around 23. South wind 5 to 7 mph becoming calm. Chance of precipitation is 80 percent. New snow accumulation of 3 to 5 inches possible. Sunday: Mostly sunny, with a high near 40. Northwest wind 6 to 8 mph. Washington's Birthday: Showers likely after 1 p.m. Mostly cloudy, with a high near 45. Chance of precipitation is 60 percent. Monday night: A chance of showers. Cloudy, with a low around 40. Chance of precipitation is 50 percent. Tuesday: A chance of showers. Mostly cloudy, with a high near 61. Chance of precipitation is 30 percent. Wednesday: A chance of showers. Mostly cloudy, with a high near 59. Chance of precipitation is 40 percent. Wednesday night: A chance of showers. Mostly cloudy, with a low around 34. Chance of precipitation is 30 percent. Thursday: Partly sunny, with a high near 43.